“Content is king” – this cliché phrase has been beaten to death by any one and everyone in the SEO industry and to take this a step further SEO consultants have always been stressing on “SEO Content” or “SEO optimized Content”. While the digital marketing world is rapidly changing and especially the SEO scene has taken a massive blow to its traditional methodologies in recent past, most SEO consultants today are still stuck to their fascination for keyword rich SEO content. 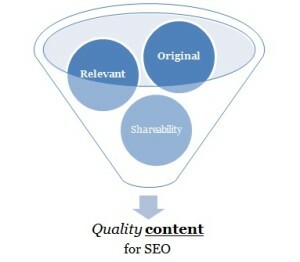 So why don’t I feel the need for search engine optimized content? Social Influence on Search Ranking: The influence of social media on search rankings has been proven beyond doubt. While we are yet to get more clarity on the extent of influence, the mass consensus is that social votes (likes, shares, tweets, plus ones etc.) across platforms and may be some platforms like Google Plus in more specific is going to be the next big currency to influence your search rankings. Social media being a manually curated environment doesn’t really favor keyword rich content that is specifically created to feed the search bots. We human beings don’t need keywords to make sense of content, we care for content that adds value to our life, something that we care to share irrespective of the fact whether they have keywords in them or not. So if you want your content to gain traction in social media, you will probably like to go easy on the keywords. Intelligent Search Engines: One of the main reasons keywords were included in content was to help the search engines identify the topic and establish the content’s relevance to the user’s search query. However, over time search engines have become much smarter in interpreting content and attributing signals from various sources in ascertaining the relevance of the content to user’s query and keywords are not really a necessity any more. Use of Microformats: Most search engines today can read and interpret micro formats. This micro formats go a long way in establishing context and helping search engine bots understand the true meaning of the textual content. This is definitely an additional help that search engines get in understanding content and further reduces the burden on webmasters to use keyword rich content. Removal of Keyword Data from Analytics: Around a year back Google stopped sending the keyword data for all organic search clicks and now they are planning to cut down the same for paid search as well, which basically means your analytics will not have any keyword data. While many consultants have been interpreting this as a signal towards reducing importance of keywords, without going into such speculation let’s look at the practical problem. If we do not know which keyword performs well, how do we know which keyword to optimize for? Mobile Search Gaining Traction: If you look at your analytics I am sure you will see the rising curve of mobile users. Yes, mobile users are increasing day by day and Google is also trying its best to cater to the same. When a user is surfing on mobile he doesn’t have the time to read long form keyword rich content but they are looking for specific relevant information. Also with Hummingbird Google is trying to answer questions directly, which needs specific, relevant and well-formatted information. We are all moving towards a context driven, socially connected smart world and keywords might be a little primitive for the same. This is not to say keywords are redundant, they definitely have their roles to play in few cases (think about extremely narrow niches) but they are no longer the priority. Write content that adds value to your users, content that is sharable, content that people would love; if keywords are present its ok, if they are not, no worries.